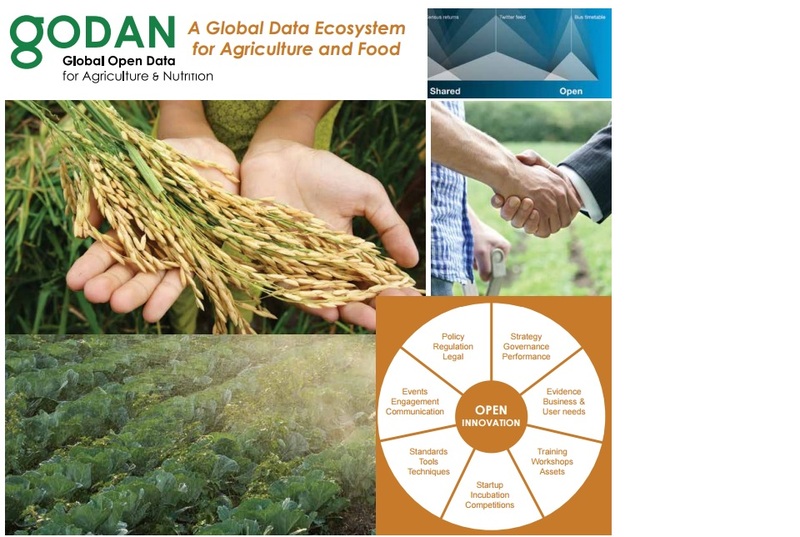 In September 2016, GODAN published a position paper 'A Global Data Ecosystem for Agriculture and Food', which explores a daring vision of an effective Global Data Ecosystem for Agriculture and Food that no single entity or network could possibly seek to deliver, but that might guided by principles of an open and adaptive global stakeholder coalition. “Agriculture would benefit hugely from a common data ecosystem. Produced and used by diverse stakeholders, from smallholders to multinational conglomerates, a shared global data space would help build the infrastructures that will propel the industry forward”, - Executive summary. What technology might be needed to build a global data ecosystem for agriculture. Sharing, opening, using and maintaining data. On this basis, appropriate and sustainable business models for the global agricultural community could be further developed. As the ultimate impact of the vision, principles, and roadmap sketched in the report are only valuable if they are acted upon, the report also calls for a disciplined and pragmatic path to progress following the principle of “thinking big but starting small”, use cases, and prioritizing action over process. Recommendations for stakeholders for building an effective Global Data Infrastructure for Agriculture. To support the development of this latter, the report invites stakeholders to follow the key global data standards (e.g., ‘Five stars of open data’), use open data certificates, and data publishing principles (e.g., ‘FAIR principles’: Findable, Accessible, Interoperable, Re-usable data) making it easier to produce, link and share data. GODAN and AGROKNOW have established a Data Ecosystem Working Group to frame better the GODAN discussion and to start to work on a common, shared data ecosystem for food and agriculture. It is desired and expected that open GODAN discussion will be broad and inclusive involving all relevant strategic stakeholders and forums globally. A Global Data Ecosystem for Agriculture and Food forums globally.